1972: A chartered flight carrying a Uruguayan rugby team to its match in Chile crashes in the high Andes, resulting in one of the most grueling survival ordeals of modern times. The plane, a twin turboprop Fairchild FH-227 belonging to the Uruguayan air force, left Montevideo for Santiago on Oct. 12, on a route that would take it over the highest mountain range in the southern hemisphere. Aviators as far back as Antoine de Saint-Exupéry, who flew the Andes as a mail pilot in the late 1920s, knew the hazards of navigation in the region. Orientation could be difficult, owing to the volatile weather conditions. In fact, the weather that day was vile. To wait things out, the plane made an overnight stop in Mendoza, Argentina. The weather was still bad the next morning, with heavy clouds over the mountains, when the plane took off. It flew south, parallel to the range, looking for Planchon, a low mountain pass, because the cloud cover made it too dangerous to attempt flying over any higher part of the Andes. The cloud cover didn’t lift at Planchon, forcing the pilots to rely on dead reckoning. That led to miscalculations that resulted in both wings being clipped and a sudden crash landing (or making a “controlled flight into terrain,” in aviation parlance) in the mountains at about 12,000 feet. Unbeknown to the pilot, the plane had been off course before it crashed, so he was transmitting inaccurate position reports that would later hamper rescuers. Twelve people were killed outright, including everyone in the cockpit. By the next morning, five more had died of their injuries, leaving 28 survivors to await rescue. Lacking cold-weather clothing and adequate medical supplies, they were nevertheless confident that rescue would be a matter of days, if not hours. Although search parties were dispatched by Uruguay, Argentina and Chile, they had only a vague idea of where the plane went down. To make matters worse, the fuselage was painted white, causing it to blend into the snow-covered mountain and making it almost impossible to see from the air. The official search was called off after eight days. The same day the search was abandoned, another survivor died of his injuries. Among the debris in the wreckage, the survivors had found a small transistor radio and managed to hear a report saying that their would-be rescuers had given up hope. It was a low point and might have signaled the end if not for Gustavo Nicolich, who told the others (whether he really believed it or not) that they would simply save themselves. 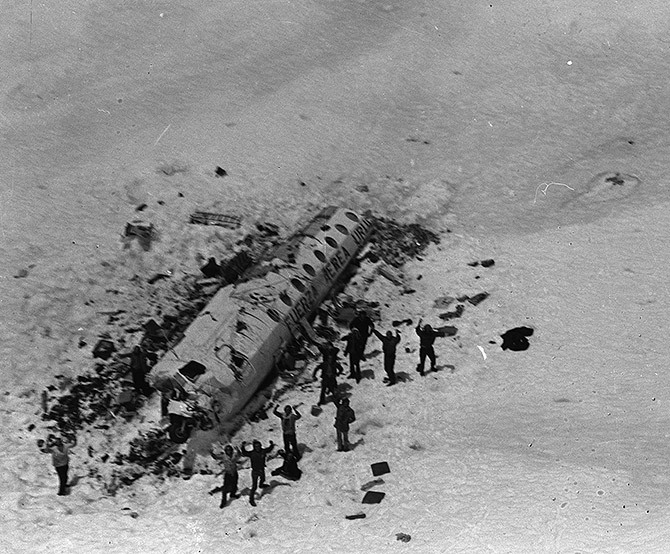 The fuselage was now serving as a makeshift shelter, the dead having been removed, so those who remained were sheltered from the worst of the weather. Crude sun glasses were fashioned from the cockpit sun visors to help prevent snow blindness. Splints and braces to hold broken bones in place were improvised from additional wreckage. But they couldn’t jury-rig food. There were some chocolate bars, airline snacks and several bottles of wine on board. They didn’t last long, however, and the specter of starvation loomed. Faced with that reality, the survivors, after much soul searching, agreed to cannibalize the dead in order to buy more time. The decision was all the more agonizing, because the survivors would be acting against their strong Roman Catholic faith. In the end, everyone agreed to it. The fact that they were by now literally starving probably helped. Catastrophe struck again Oct. 29, when an avalanche partially buried the fuselage and killed nine more people. After that, the realization set in that waiting for rescue was futile. Another boy died from his injuries. It was decided that the three strongest survivors would attempt the dangerous trek out of the Andes in search of help. After a few false starts, Nando Parrado and Roberto Canessa (the third trekker having returned to the fuselage) managed to get below the snow line. Twelve days after setting out, they found some Chilean horsemen who relayed the message that there were still survivors in the mountains. It was mid-December. The final rescue, undertaken by helicopter crews, began 72 days after the crash. By Dec. 23, the final 16 survivors from the original group of 45 had been saved. The story has since been retold in books, film and, more recently, interviews with some survivors.